James Montier Unholy Trinity is a three point short selling strategy inspired by research by economist and equity strategist James Montier called Joining The Dark Side: Pirates, Spies and Short Sellers The approach uses three risk factors to identify stocks that might be overvalued, financially weak and poorly managed. It uses the price-to-sales ratio to find companies that appear to be overvalued based on their revenues. It looks for signs of low quality by finding stocks that score less than 3 out of 9 on the Piotroski F-Score of financial health. Finally, Montier looks for companies where asset growth could be excessive, based on the theory that management tend to be wasteful allocators of capital. James Montier wrote: "It never ceases to amaze me that whenever a major corporate declines the short sellers are suddenly painted as financial equivalents of psychopaths. This is madness, rather than examining the exceptionally poor (and sometimes criminal) decisions that the corporate itself took, the short sellers are hauled over the coals." Montier found that between 1985 and 2007 a portfolio of Unholy Trinity stocks rebalanced annually would have declined over 6% p.a. compared to a market that was rising at the rate of 13% p.a. in Europe. Short selling shares can be very risky but the Unholy Trinity can still be used as an indicator of which stocks should be avoided. Former head of Global Strategy at Société Générale, now works for GMO. Author of 'Behavioural Investing' & 'Value Investing: Tools and Techniques for Intelligent Investment'. The seductive elegance of classical finance theory is powerful, yet value investing requires that we reject both the precepts of modern portfolio theory (MPT) and pretty much all of its tools and techniques. 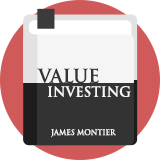 This book explains how value investing is the only tried and tested method of delivering sustainable long-term returns.